This month Washington is consumed by the impasse over reopening the government and raising the debt limit. It seems likely that this episode, like the 1995-96 government shutdowns and the 2011 debt limit scare, will be remembered mainly by the people directly involved. But there is a chance future historians will see today’s crisis as the turning point where American democracy was shown to be dysfunctional – an example to be avoided rather than emulated. The tragedy is compounded by the fact that most of the substance being debated in the current crisis is only tangentially relevant to the major challenges and opportunities facing the United States. This is the case with respect to the endless discussions about the precise timing of continuing resolutions and debt limit extensions, or the proposals to change Congressional staff healthcare packages or cut a medical device tax that represents only about .015 percent of GDP. 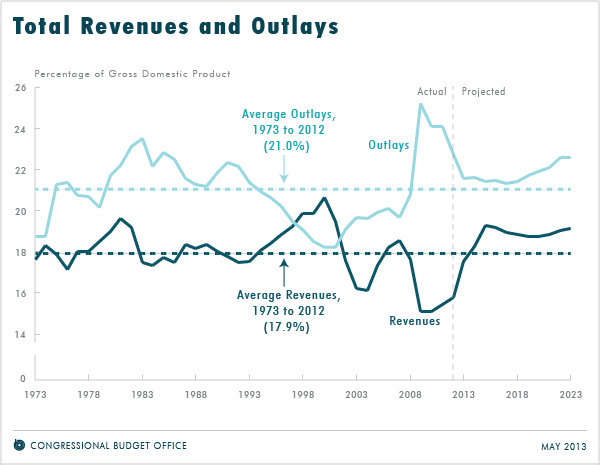 More fundamental is this: current and future budget deficits are now a second order problem relative to other more pressing issues facing the American economy. Projections that there will be a major deficit problem are highly uncertain. And policies that indirectly address deficit issues by focusing on growth are sounder in economic terms and more plausible in political terms than the long-run budget deals with which much of the policy community is obsessed. The latest Congressional Budget Office projection is that the Federal deficit will fall to 2 percent of GDP by 2015 and that a decade from now the debt-to-GDP ratio will be below its current level of 75 percent. 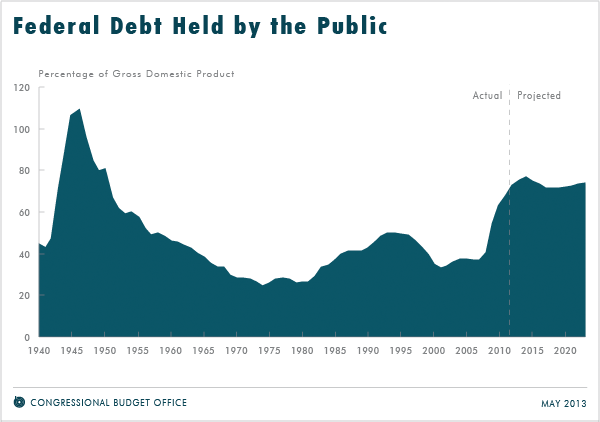 While the CBO projects that under current law the debt-to-GDP ratio will rise over the longer term, the rise is not large relative to the scale of the U.S. economy. It would be offset by an increase in revenues or a decrease in spending of .8 percent of GDP for the next 25 years and 1.7 percent of GDP for the next 75 years. These figures lie well within any reasonable confidence interval for deficit forecasts. The most recent comprehensive CBO evaluation found that, leaving aside any errors due to policy changes, the expected error in projections out only five years is 3.5 percent of GDP. Put another way, given the magnitude of forecast uncertainties there is a chance of close to 40 percent that with no new policy actions the ratio of debt-to-GDP will decline over 25 or 75 years. But in most areas policymakers avoid strong actions without statistically compelling evidence. Few would favor action to curb greenhouse gas emissions without evidence establishing that substantial climate change is overwhelmingly likely. Yet it is conventional wisdom that urgent action must be taken to cut the deficit, even as prevailing short-run deficit forecasts suggest no problems and long-run forecasts are within margins of error. To be sure, there are steps that matter profoundly for the long run that should be priorities today. Data from the CBO imply that an increase of just .2 percent in annual growth would entirely eliminate the projected long-term budget gap. Increasing growth, in addition to solving debt problems, would also raise household incomes, increase U.S. economic strength relative to other nations, help state and local governments meet their obligations and prompt investments in research and development. Beyond the fact that spurring growth has a multiplicity of benefits, of which reduced federal debt is only one, there is the further aspect that growth-enhancing policies have more widely-felt benefits than measures that raise taxes or cut spending. Spurring growth is also an area where neither side of the political spectrum has a monopoly on good ideas. We need more public infrastructure investment, but we also need to reduce regulatory barriers that hold back private infrastructure. We need more investments in education, but also increases in accountability for those who provide it. We need more investment in the basic science behind the renewable energy technologies, but in the medium term we need to take advantage of the remarkable natural gas resources that have recently become available to the U.S. We need to assure that government has the tools to work effectively in the information age, but also to assure that public policy promotes entrepreneurship. If even half the energy that has been devoted over the last five years to "budget deals" were devoted instead to "growth strategies" we could enjoy sounder government finances and a restoration of the power of the American example. At a time when the majority of the U.S. thinks that the country is moving in the wrong direction, and family incomes have been stagnant, a reduction in political fighting is not enough – we have to start focusing on the issues that are actually most important.